Good pilots are always learning, but so are good instructors. Good instructors understand that they don’t know it all and are always open to learning more. We seek knowledge in all the same places our students do - online forums, YouTube, aviation events, air shows, hangar flying, ground schools, and various text materials. 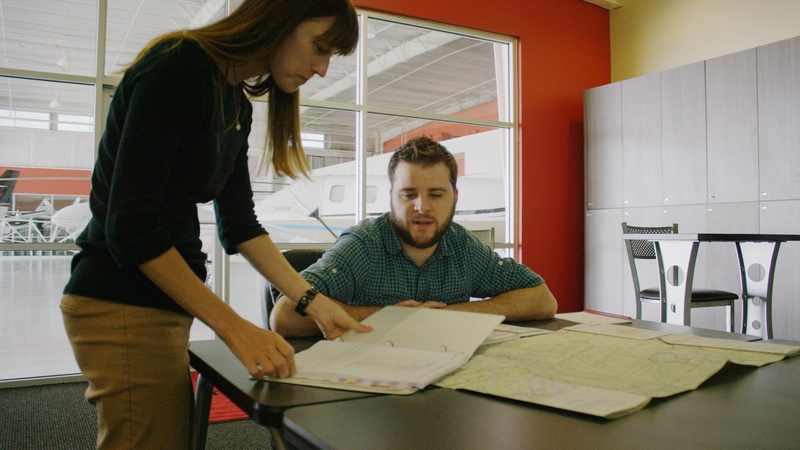 But what I’ve found is that some of the most important lessons in flying have come directly from my students, and most of the time they’re ideas that are not immediately apparent, but lessons learned over time. On your next flight, open your mind to learning instead of just teaching, and you’ll discover that your students are teaching you, too, whether you realize it immediately or not. Here are five things my students have taught me. 1. What a good pilot really looks like. One of the advantages to being a flight instructor is that we get to fly with many, many different pilots. As an instructor, we see a variety of skill levels among primary students, of course, and we can often discern the “normal” from the “challenged” among beginning students right away. And after performing multiple flight reviews, we discover that there is a very, very, wide range of pilot skills and abilities out there among already certificated pilots. Some pilots are over-prepared, fret over every detail, and fly the airplane to standards without a doubt. Others show up unprepared, can’t keep up with the airplane, and then complain about how much you’re charging them when you recommend a second or third flight. And then there’s everyone in between: the pilot who excels at maneuvers but bounces each landing, or the pilot who is overly dependent on his iPad and gets lost and flustered when it overheats. But because you fly with so many people, you’re able to discern the good pilots from the bad, and you know what a good pilot really looks like. 2. How to talk less and ask more questions. I’m always working on this one. But if there’s one thing I’ve learned from my students’ feedback, it’s that I shouldn’t talk so much, and that asking questions provides for a better learning experience for both the CFI and student. Throughout my years of instructing and soliciting feedback from students, I have come to understand that talking less is a strategy that I should employ more. Students need to mess up on their own and they need to be given the time to identify their own mistakes. And as an instructor, asking questions and encouraging the student to problem-solve is more effective than offering up answers. 3. That letting go of control and trusting someone else is hard. Trust is an easy thing to understand, but difficult to do. We all know it’s difficult to put our lives in someone else’s hands, and we all seem to understand that it takes time to build trust while it only takes a second to break it. But we don’t often trust our students, and we get into a situation where our students don’t trust us. So I often ask my students to understand that it takes patience to earn my trust enough to be able to hand over the airplane to them so that they can land completely on their own, and once that happens, it would be wise of them to do everything in their power to respect it. At the same time, I have to understand that it takes time for them to trust me, and even after they might trust me, I might do something that causes them to pause. Trust is a difficult and personal topic, which makes flight instruction a difficult and personal activity. The student must trust that the instructor has their back, and the instructor must trust that they’ve taught the student enough to excel on their own. It’s fun to experience this process with each student, but it’s a learning experience every time. 4. That we should never assume anything. I’ll be honest - I often think that I have this one down. But then something happens to remind me that I just can’t assume anything. Don’t assume that just because they’ve attended a ground school that your student knows what it means to climb at Vx or Vy. Don’t assume that the 25,000-hour airline pilot understands how to properly shut down - or tie down - an airplane. And never, ever assume that your student checked the fuel levels. We have all read those accident reports. 5. That everyone has insecurities, and the airplane doesn’t care. Everyone I’ve ever gotten into the airplane with has some sort of insecurity. Often it’s radio anxiety. Sometimes it a fear of heights, or uncertainty about the avionics. Often it will stem from a cultural barrier, or insecurity about age, young or old. As instructors, we face these insecurities, too. I will often remind myself when I face self-doubt that the airplane doesn’t care how young and inexperienced I am, or how old and wise my student is. It doesn’t care that I’m unfamiliar with the airport my student chose to fly to, or that my student is timid on the radios. The airplane just doesn’t care about any of our insecurities. But it does provide a place for confidence to grow and an environment where we each face - and conquer - our fears. These are just a few of the things I’ve learned from my students. I’ve also learned the value of being specific in my observations and evaluations, how to keep things fun when they start to get too serious, and how to help a student through a learning plateau, among other things. And I have so much more to learn. We all have more to learn - about teaching and flying. We can start by paying more attention to what our students are teaching us. So what have your students taught you lately?